After avoiding a pitfall many of its competitors are heading for, America's largest biotechnology company looks like a much better option. In recent years, bluebird bio (NASDAQ:BLUE) has excited the medical community with terrific results for experimental therapies. Deep-pocketed biotechs and everyday investors have funneled billions into Bluebird and similar start-ups to help them develop complex treatments, and the competition is heating up fast. While investors become increasingly worried about Bluebird's pipeline, Amgen Inc. (NASDAQ:AMGN) has taken a much simpler approach that could pay off down the road. Here's why shares of the country's largest biotech probably have a better chance to outperform bluebird bio and its peers. In 2015, Amgen gave Kite Pharma $60 million upfront to discover new chimeric antigen receptor T-cell (CAR-T) therapies, which are actually a patient's own immune cells that have been trained offsite to recognize and attack cancer cells. When Gilead Sciences (NASDAQ:GILD) acquired Kite for $12 billion in 2017, Amgen let its partnership expire in order to focus on bi-specific T-cell engagers (BiTEs), because they accomplish the same task as CAR-T in a much simpler manner. Amgen's BiTEs are just double-sided proteins that attach to targets found on cancer cells with one arm while the other attracts nearby immune cells. Amgen's decision to avoid complex cell-based treatments received some criticism at the time because its first bi-specific drug was still fizzling on the launchpad while CAR-T drugs kept producing thrilling clinical trial results. After watching CAR-T treatments disappoint in the commercial setting, though, Amgen's BiTEs seem like a smart move. Gilead launched a CAR-T treatment in 2017 called Yescarta that still hasn't taken off. Third-quarter Yescarta sales that reached $75 million weren't necessarily terrible, but there are dozens of treatments in mid-to-late-stage development right now directed at the same target. Once they enter the fray, it's hard to see how Gilead will realize a return on its acquisition. Bluebird's lead treatments in development are bb21217, a BCMA-directed CAR-T therapy, and LentiGlobin, a cell-based treatment for beta-thalassemia and sickle-cell disease. At a recent medical conference, Bluebird was just one of several CAR-T candidates aiming for BCMA with eye-popping results, and the beta-thalassemia space is getting crowded as well. Amgen's bi-specific T-cell engagers didn't get off to a great commercial start, largely because a round of treatment requires nonstop intravenous infusion for 28 days. In their favor, though, Amgen's BiTEs can be taken off a shelf, allowing patients to begin treatment immediately after their oncologist signs the papers. Acute lymphoblastic leukemia (ALL) patients considered in complete remission often have a smattering of leukemia cells that only show up on more sensitive tests. Minimal residual disease (MRD) almost always leads to trouble, but it looks like Blincyto can stop it cold for the vast majority of patients. Blincyto's first launch as an ALL treatment for advanced-stage patients didn't get much attention until researchers proved it could make an important difference for less-advanced patients in nearly complete remission. A round of Blincyto helped 70 out of 86 patients achieve an MRD negative test. More recently, Amgen's multiple myeloma candidate, AMG-420, which aims at the same target as bb21217, produced some interesting results for multiple myeloma patients who have exhausted other treatment options. During a dose ranging study, AMG-420 elicited responses from 13 patients, seven of whom were in a group of 10 that received a dosage strength that will probably advance to larger studies. Amgen's BiTEs won't be easy to market because of their round-the-clock dosing schedules, but the company's relatively modest investment into the drug class should at least earn a positive return. That's a lot more than you can say for bluebird bio, and part of the main reason Amgen's a better stock. Investors want to own Amgen because it manages operating expenses so carefully that it can keep taking shots on goal with potential new drugs while still delivering heaps of cash to shareholders. Keeping costs in check helped the company generate a whopping $10.5 billion in free cash flow over the past 12 months. 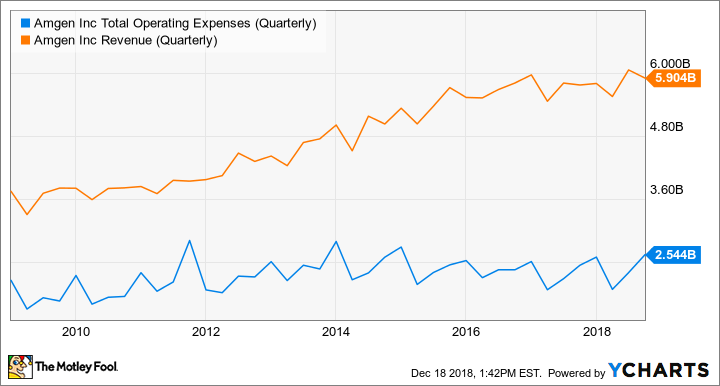 AMGN Total Operating Expenses (Quarterly) data by YCharts. Amgen's operations have been so profitable that the company's been able to raise its dividend 418% over the past decade. Despite substantial raises, the company used just 33.5% of free cash flow operations generated over the past year to meet its obligation to shareholders. Rather than shovel all its leftover cash into a bottomless pit of mergers and acquisitions, Amgen has bought enough of its own shares to lower the total number outstanding by 27.5% over the past decade. Fewer shares will make future payout bumps much easier, and a handful of young growth drivers in the company's product lineup could give management a lot more to work with. Amgen's best-selling drug for years, Enbrel, has lost ground to biosimilar competition, but the company's about to give its peers a dose of the same medicine. In October, Amgen launched a biosimilar version of the world's top-selling drug, Humira, throughout Europe. More recently, the company submitted an application to the FDA for a low-cost version of another blockbuster anti-inflammation treatment, Remicade. Amgen also launched the first of three new therapies in 2018 that reduce the frequency of migraine headaches, and the launch is going well so far. This big biotech might be too large already to generate explosive profit growth, but there's a good chance it will provide more market-beating gains in the years ahead.